In this June 28, 2017 photo, Philippine President Rodrigo Duterte checks the scope of a Chinese-made CS/LR4A sniper rifle. Crime fell more than one-fifth in the Philippines this year, delighting the public and indicating that perhaps President Rodrigo Duterte's deadly anti-drug campaign - which stirred international outrage over human rights issues - is deterring crime. Illegal acts against people and property declined 21.8 percent from January through November this year, compared to the same period of 2016, according to Philippine National Police figures cited by domestic media. That figure points to progress in Duterte's controversial anti-drug campaign as well as "overall effort by police," said Antonio Contreras, political scientist at De La Salle University in the Philippines. "That's a lot, so that means an indication that the efforts are working," Contreras said. He expects the government and social media fans will use the data to emphasize that point. "It's going to be used and spun by the supporters," he said. National police figures cited by domestic media indicate the total number of reported crimes used for statistical purposes fell to 100,668 in the first 11 months of the year. Only homicides went up. A presidential office spokesman told reporters Monday crime had gone down 35 percent but did not offer details. Filipinos are saying through public opinion surveys they feel safer under Duterte's anti-crime campaign, Contreras noted. That support has allowed the president to push back against critics at home as well as human rights advocacy groups and foreign governments that denounce letting the police kill suspected drug dealers on sight. The tough-spoken president's satisfaction rating rose from 67 to 71 percent in the final quarter of 2017, Metro Manila-based research institution Social Weather Stations found. At the Dec. 20 wake of a police officer slain in a Metro Manila drug bust, Duterte said he "will eradicate everyone involved in the illegal drug trade," according to the presidential office website. "I think the policy is really working and his rhetoric, his behavior and his attitude as a leader has a huge impact in our community," said Dexter Feliciano, Filipino voter and founder of a startup firm in Metro Manila. "He knows how to intimidate these criminals. That's why the crime rate dropped." 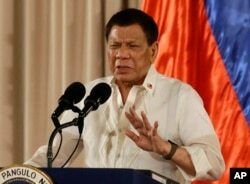 Duterte, who took office in June 2016, has allowed police to kill suspected drug dealers rather than taking them in for prosecution, foreign rights groups and political opponents at home believe. The president vowed last year to eradicate major crimes in three to six months after taking office. Since his inauguration in June 2016, the 72-year-old leader has acknowledged personally killing criminal suspects while the mayor of the second-largest Philippine city Davao. New York-based advocacy group Human Rights Watch estimates 7,000 extrajudicial killings have occurred under Duterte's presidency. Former Philippine President Benigno Aquino III places a candle under a picture of victims of alleged extrajudicial killings after a mass at the University of the Philippines Church of the Holy Sacrifice. The approach to drug crime has drawn fire from Western governments and the United Nations High Commissioner for Human Rights, in some cases prompting threats or stinging replies from Duterte. Filipinos themselves protested in the streets of Manila after mid-August, when a 17-year-old high school student was shot to death north of the capital Manila, possibly by police. In separate police-linked incidents, a 19-year-old man was found shot to death and the body of a 14-year-old boy turned up full of stab wounds. But common Filipinos often say their neighborhoods are safer now, compared to pre-Duterte years, with fewer burglaries, theft and traffic crimes as well as street side drug deals. Although most citizens like the campaign against illegal drugs campaign, "they want drug suspects arrested alive" and believe "public safety fears have not gone down as promised" by the president, Social Weather Stations said based on surveys conducted this year. Analysts expect Duterte will retrench his anti-drug campaign after the protests to avoid the deaths of more young people by police - but overall keep letting officers shoot to kill. 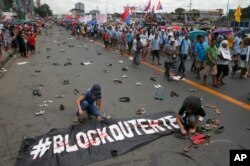 Protesters scatter pairs of slippers and shoes to symbolize victims killings in the so-called war on drugs of President Rodrigo Duterte. The president in early December gave police "just another year" to eradicate drug threats. He ordered officers to resume anti-drug enforcement as before, domestic media outlets say. More suspects will be slain, analysts predict. "I don't think that's going to stop," said Herman Kraft, political scientist at University of the Philippines Diliman. "That's pretty much how President Duterte has actually laid out his basic strategy behind the war on drugs, and so that's not really going to change."